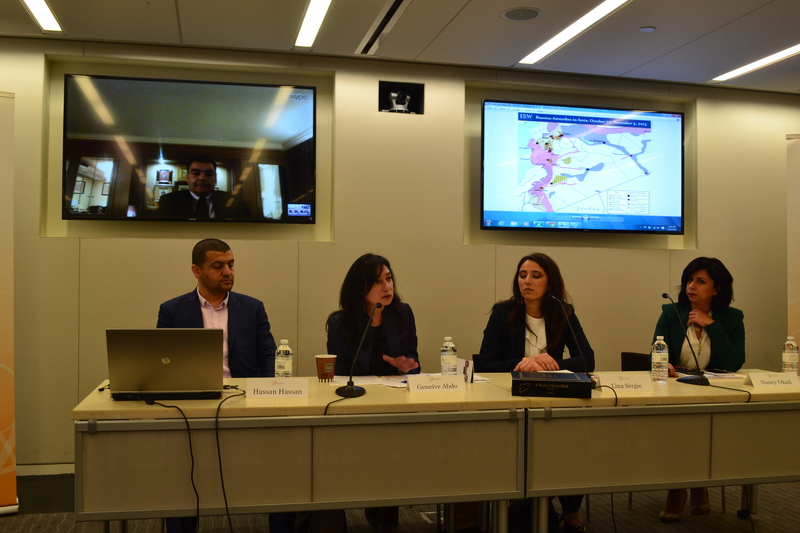 On March 15, 2016, the Tahrir Institute for Middle East Policy (TIMEP) hosted a panel discussion entitled “Five Years After the Syrian Uprising,” in observance of five years passing since the beginning of the Syrian uprising against Bashar al-Assad. The attending panelists included Hassan Hassan, a resident fellow at TIMEP focusing on Syria and Iraq; Lina Sergie Attar, the co-founder and CEO of Karam Foundation; and Bassam Barabandi, a former Syrian diplomat who currently advises the Syrian opposition. Mr. Barabandi attended the session via video conference from Geneva, Switzerland. The discussion was moderated by Geneive Abdo, a nonresident senior fellow at the Atlantic Council’s Rafik Hariri Center for the Middle East. The event opened with an introduction by Dr. Nancy Okail, Executive Director of TIMEP, who stressed the importance of the current crisis in Syria being rooted in an uprising, and the value of hearing from Syrians who have been involved throughout. During the discussion, each panelist shared their personal experiences in Syria over the past five years. The panel then turned to perspectives on the current conflict, with Mr. Hassan speaking to the roles being played by different groups on the ground, Mr. Barabandi focusing on the feasibility of a political solution, and Ms. Attar addressing humanitarian implications. The audience raised questions about the involvement of Russia in Syria and how its recent departure could shift the current dynamics. Other questions spoke to the rise of the Islamic State, the goals of Bashar al-Assad, and the role of Turkey as it relates to the Kurdish YPG forces.